Alright, alright, I’ll admit it. 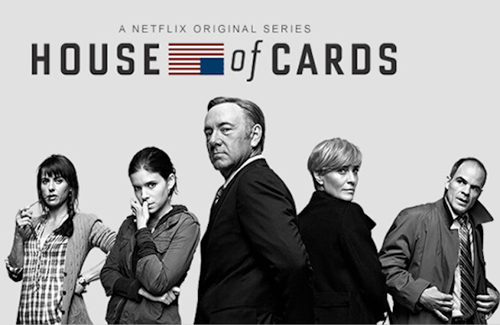 The House of Cards remake is addictive, beyond that, it’s actually quite good. Look, I’m one of those indignant people that saw the original, (thank you very much!) and the idea of Smug Spacey taking the place of world’s most charming bad old man, Ian Richardson, well it was not something I was prepared to embrace. When I began the series, it was a guilty pleasure. I mocked Spacey’s ‘Our Town’, folksy asides and I still laugh at the “hip” political blog office where extras must have been paid to gleefully roll around the desk-less room on office chairs for days. But when it’s all said and done, despite its flaws, House of Cards is taut, clever, enjoyable, and very well written. The cast is mostly great. Corey Stoll and Robin Wright stand out for adding dimension to their tough roles while Kate Mara just teeters on the edge of being annoying enough to ruin a good thing. I love that Netflix is capable of producing quality programming and embrace that they make the entire series available at once – especially in comparison to, say, HBO who guards their content, even to paying subscribers, as if it were gold. I’m very looking forward to the next season and have even more high hopes for Arrested Development when it returns in the same fashion.